There's no minimum in-state residency requirement if at least one spouse was living in Massachusetts when the marriage broke down. If you and your spouse have differences that you can't resolve, you qualify for no-fault divorce. Review and sign the completed documents. File the Joint Petition for Divorce, Separation Agreement, and related documents with the Court Clerk. The judge signs the Judgment of Divorce finalizing your divorce. In an uncontested divorce, the judge usually signs the Findings of Fact and Decree of Dissolution finalizing the divorce 60-days from the date the divorce was filed. Each spouse will receive a signed copy in the mail. 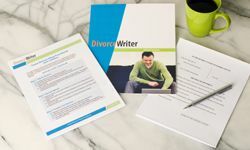 You have qualified to use DivorceWriter to complete your Massachusetts divorce papers online. Select "Continue" to start the interview.